This beautiful, spacious, redwood cottage sits on incredible Island Lake about 2 miles out side of the unincorporated community of Orange Springs. Set on a perfect, private lake lot, the property consists of the large main house, a spacious guest house, carport, dock, boat house, and patio. Great lake views, old live oak trees with Spanish moss, and a lake breeze describe this picturesque environment. Completely renovated in 2011, this marvelous retreat has a large kitchen with gas range; dining, living, and family rooms overlooking the lake; new baths; laundry facilities; well-appointed furnishings; and more. The main house sleeps 7. If you rent the optional guest house (2 persons), the property can accommodate a total of 9. The dock is terrific for fishing and the lake is great for swimming. 80 feet of shoreline awaits you. There is a canoe, charcoal grill, picnic table, and fire pit for relaxing outdoors. As well, I have 2 other lake houses nearby if this one seems too large. OTHER LAKE OPTIONS: Check out my two other lakefront properties on the next lake over. These other 2 are next door to each other on separate acres. Ideal to rent just one cottage or for a large family gathering by leasing both. Listing/ Property IDs: 127321 and 117133. My family has owned property around this area since the late 1940's, and my ancestors came to Florida in 1845, when it was still a territory. It became at state 1848. After extenisve renovations and infrastructure upgrades, I began renting our other 2 lake homes in 2004. I wanted others to enjoy this part of Florida as I did growing up. I have a wonderful local staff that works to ensure that guests are satisfied. I bought this property in 2011 because Island Lake is a stunning body of water. It is THE real natural Florida. Spectacular views, privacy, wooded lot, and no traffic or crowds. Free standing home on enormous, private lake lot with old live oaks. Beautiful lake for all activities: boating, fishing, swimming, etc. Rural, yet elegant home with great furnishings. Internet, WiFi, free US long distance calling, cable TV, Smart TV with 10 MEG download capability, and more. Stackable, high efficiency Kenmore washer and dryer. Tons of room: carport, circle drive, etc. Gas and easy to use ! More than most places you will rent! Tervis tumblers, wine glasses, plenty of plates and silverware. Gas Range, granite counter tops, kitchen island, ice maker, and very spacious! Beautiful solid wood table. Dining room has wonderful view of lake. Florida Cable with great selection of channels. Canoe for guests use. Paddles and lifejackets provided. Very clean and quiet. Ed was very helpful. The house is beautiful and also the view of the lake. Very clean and comfortable house. The pictures don't do justice to the place. It's more beautiful in person. The house was super clean and very comfortable. We had a fantastic time cooking out and roasting marshmallows on the fire. The view of the lake from the house is very peaceful and relaxing. Thank you for sharing your little paradise with my family. The home was gorgeous. We enjoyed our stay. The home is even more beautiful in person. The view of the lake is gorgeous. The home is large enough to spread out and still feel cozy. The yard was where we spent most of our time hanging by the firepit and kayaking was very enjoyable. Plenty of room for parking since we had adult children meeting us there. Thank you for the use of your home. Thank you for being guests. I am so glad you had a nice time. Our objective is to provide a spotless home in a gorgeous natural Florida setting. Kind regards! Perfect escape from the hustle and bustle! This was a great place to stay after attending a Gator game! Especially a winning Gator game! We went with our dogs for Labor Day weekend and knew it was going to be awesome. It was exactly as we expected. Super relaxing and so gorgeous. Can’t believe I found this lake in Florida so close to home. We swam to the island, floated on water floats, watched everyone going by boating, tubing, skiing, etc. the yard was nice and big for outdoor games and the dogs. We took the canoe around the lake. We grilled out and had smores on the fire pit. The house was very comfortable. We want to come back and bring friends. Planning to return very soon!! Thanks Ed! Thank you very much for the kind words. While the nature al environs are spectacular, we work to make the visit easy, clean, and pleasant. Much appreciation. This beautiful and natural lake region lies near the Ocala National Forest. 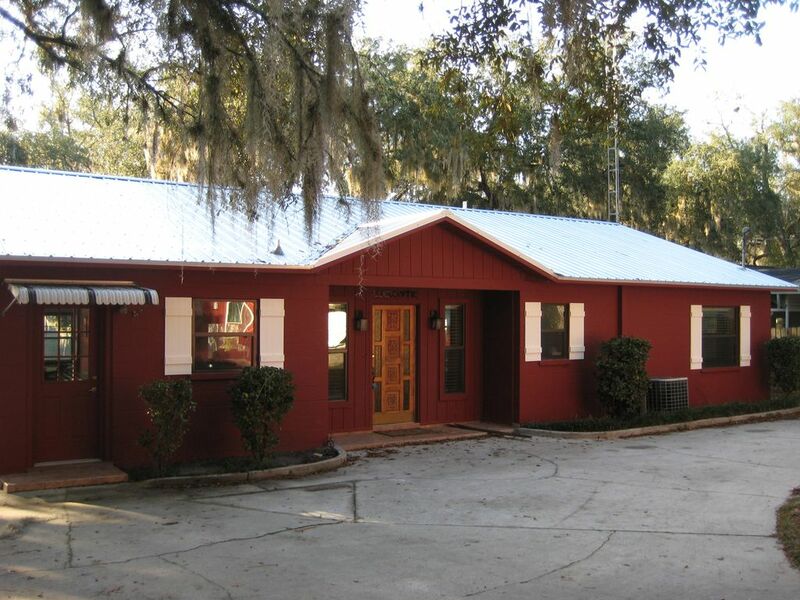 This delightful rural area sits in a perfect triangle between Ocala, Palatka, and Gainesville, Florida. Minutes from the west side of the Ocala National Forest, one can explore the Ocklawaha River, numerous springs, the St. John's River, etc. Hiking the forest, fishing, and swimming are other cost free activities. Plus, it is 55 minutes to the east coast beaches. There is much to do in the area's rivers, lakes, and springs. ******* Also, check out my other two Homeaway listings # 127321 and # 117133. The platform of homeaway.com/VRBO calculates discounts for stays of 7+ nights and, and another discount for stays of 28+ nights. The optional Guest House Studio is not included in any quotes. I have to give you those rates and modify the quote manually. The guest house is very economical! All are outstanding values! !